, a young writer of very promising talents, was born in Ireland in 1736, whither his father, a dissenting teacher at Stratford upon Avon, had removed; and from whence, on his death, the widow and family | returned to England. After having gone through a grammatical education, John was sent to the dissenting academy at Daventry, where he prosecuted his studies with commendable diligence, and was afterwards put under the tuition of Dr. Benson, who had sometimes young students under his care, after they had finished their university or academical education, for the purpose of instructing them in a more critical acquaintance with the sacred writings. He afterwards entered into the ministry, which he exercised in and near Birmingham, but principally at a small village called Longdon, about twelve miles from that place. On Saturday, Dec. 28, 1765, he returned to rest, in perfect health, between eleven and twelve o’clock, intending to officiate at Longdon next day but at six in the morning he was found dead in his bed; an event which was sincerely deplored by his friends, both as a private and a public loss. 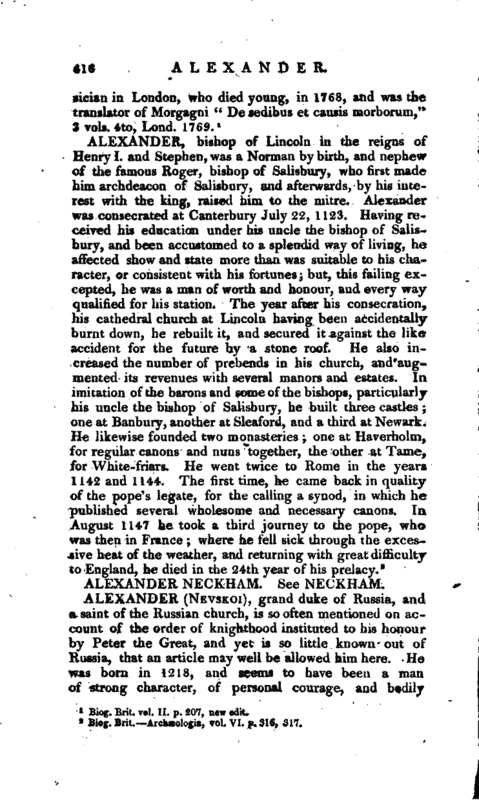 After his death, the rev. 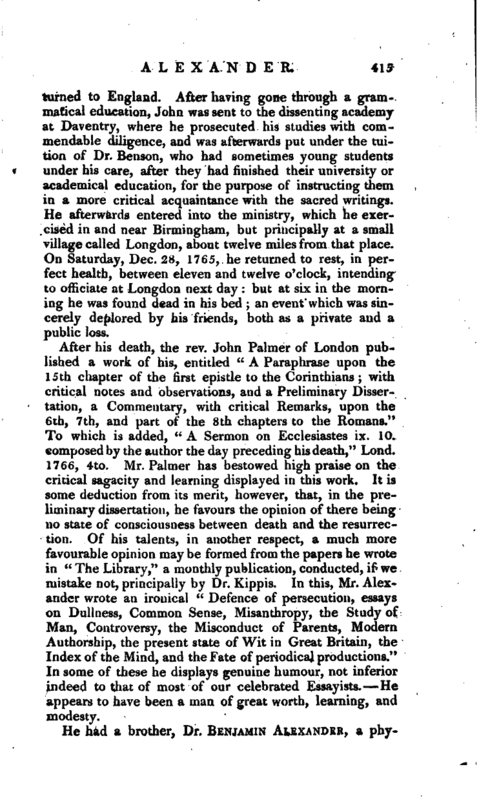 John Palmer of London published a work of his, entitled “A Paraphrase upon the 15th chapter of the first epistle to the Corinthians; with critical notes and observations, and a Preliminary Dissertation, a Commentary, with critical Remarks, upon the 6th, 7th, and part of the 8th chapters to the Romans.” To which is added, “A Sermon on Ecclesiastes ix. 10. composed by the author the day preceding his death,” Lond. 1766, 4to. Mr. Palmer has bestowed high praise on the critical sagacity and learning displayed in this work. It is some deduction from its merit,' however, that, in the preliminary dissertation, he favours the opinion of there being no state of consciousness between death and the resurrection. Of his talents, in another respect, a much more favourable opinion may be formed from the papers he wrote in “The Library,” a monthly publication, conducted, if we mistake not, principally by Dr. Kippis. 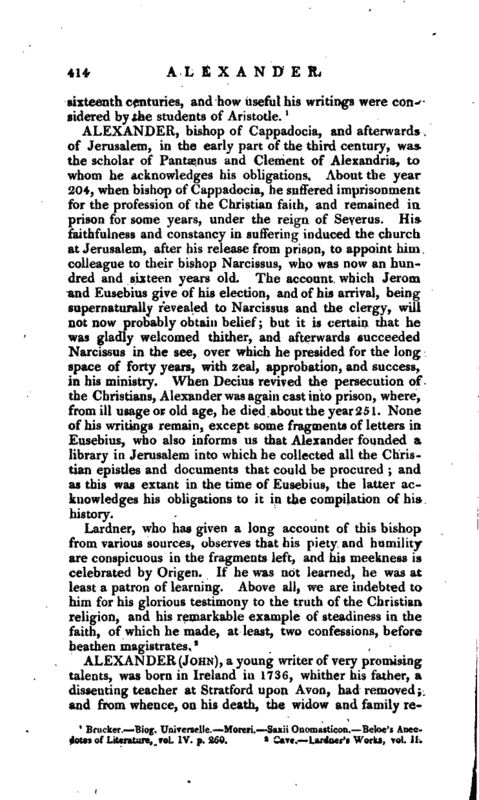 In this, Mr. Alexander wrote an ironical “Defence of persecution, essays on Dullness, Common Sense, Misanthropy, the Study df Man, Controversy, the Misconduct of Parents, Modern Authorship, the present state of Wit in Great Britain, the Index of the Mind, and the Fate of periodical productions.” In some of these he displays genuine humour, not inferior indeed to that of most of our celebrated Essayists. He appears to have been a man of great worth, learning, and modesty. Biog. Brit. vl. II. p. 207, new edit.